A word about John Carter and some news | Marie Loughin's "I WANNA BE . . ."
I do have an excuse. In addition to my usual paying jobs, I am teaching an all-consuming technical writing class this term. I have so many balls in the air that I can’t see the sky. I’ve already blown Goal #5 for 2012 (“Write one blog post a week. That’s 52 posts, minimum”). Two and a half months into 2012 and I’m six posts behind. At least I’ve managed to stick with Resolution #3 for 2012 (“Don’t let blog lapse”). I can only hope that I can fulfill Goal #1 for 2012 (“Survive teaching technical writing class without requiring counseling, therapeutic massage, or stitches”). It will be a close call. Despite all of this busy-ness, I made time to see John Carter last night. I had to. I have a special fondness for Edgar Rice Burroughs. His work may not directly influence my current writing, but it definitely contributed to the corruption of my literary imagination during my early teenage years. When I found out Disney had made a Barsoom movie, I had to see it. In the theater. In all of its 3D glory. If you’re at all interested in this movie, you’ve probably noticed the mixed reviews. It’s all a matter of expectation. If you expect the story to adhere to the laws of physics, you’ll be disappointed. If you’re expecting depth of character and dialogue, you’ll be dismayed. But if you take the movie for what it is meant to be—a nostalgic, action-packed science fantasy—you will have a great time. 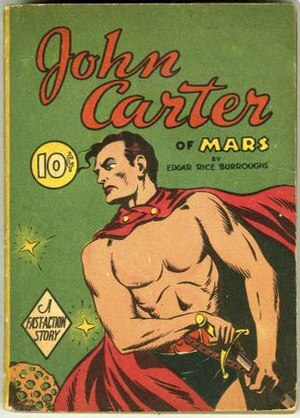 And if John Carter echoes Star Wars and Avatar in some ways, perhaps that is because Star Wars and Avatar resound with influences from the 1917 novel on which John Carter is based, A Princess of Mars. I almost forgot. I do have one bit of news to share. My story Hell Hole is now appearing in the humor collection Anthology from Hell, edited by Julia S. Mandala. Anthology from Hell has been available for a few weeks now. It’s stuffed with stories from some pretty good writers, including Esthner Friesner, Spider Robinson, and Lawrence Watt-Evans. I’m told the anthology is selling well at the Yard Dog tables at science fiction conventions. In fact, it’s been selling so well that the first run sold out. I would like to give you a review of the other stories in the anthology, but I haven’t had a chance to read them yet. Yard Dog sold my author’s copy. Happily, the great thing about small press operations is that they have no qualms about printing more copies of a book that’s selling well. You can order a print copy of the anthology directly from Yard Dog Press. Who knows, maybe you’ll get to read it before I do. This entry was posted in Marie's Fiction, Ruminations and tagged Anthology from Hell, Barsoom, Edgar Rice Burrough, Hell Hole, John Carter, Short Fiction. Bookmark the permalink. Glad you’re surviving the teaching job. I got the ERB John Carter collection from Amazon (the version I got was free, but very well done with good formatting and illustrations). The writing is horrible. Really awful. I doubt very much ERB influenced anyone in a literary way. BUT, rereading Princes of Mars swept me right back to my childhood. It fired my imagination, sucked me right into the IDEA and the fantasy. It made me want to be John Carter or the princess all over again. No ebook on the anthology? As for the anthology, they said it would be in e-books in 6 weeks after print publication. I’ll mention it again, when it’s available. Will definitely be looking for the anthology when it’s available in ebook format, though I may need to get a signed print copy at some point 🙂 Congrats on getting that out there. Hang in there. I can relate to some of your frustrations with schedule, too. I guess we can only take things at our own pace. The semester must be getting close to drawing to an end… hang in there! And huge congratulations on your story’s inclusion in the anthology. Great job!! Into the home stretch. And I made some decisions that will make the end of the term a little easier. Good for you! I understand doing that. I just switched career paths to make it possible for me to have the creative energy I need for writing. Congratulations indeed. And good luck with the last leg of the semester. With a toddler (and a teacher’s salary), we don’t get out to the movies that often, but I’ll put this one on the list. It looks like it’s something that should be seen on the big screen. I know what you mean. I get worried about favorite bloggers, too, when they disappear with no explanation. At least I’m posting every second week. That’s better than this time last year. The movie sounds like something I’d enjoy. I love nostalgic, action-packed science fantasy! Congrats on the story in the anthology. That is fantastic!